Upendra cooks for his two younger brothers, feeds them and walks 2 kms to“Koseli” from the Jadibuti slum. He is 12 yrs old and his brother, Chandeshwor 10 yrs. Now, there is a little confusion here. Chandeshwor says he has attended two “Gadimai Melas” (religious fair held in their village every five years) and assumes that he must have been at least two years old to remember the first one which means he is 12yrs now and since Upendra is 2 years older he is 14yrs. Every time this conversation comes up, Upendra only smiles mysteriously which leaves us all guessing. However, looking at their height and growth patterns we have decided that Upendra should be 12yrs and Chandeshwor, 10yrs. The matter is more or less settled temporarily. What sets these three brothers apart from the rest of the kids at Koseli is that they are the poorest among the slum kids. In the 21st century, they live a life without a toilet. Like most of our findings at Koseli, we discovered this one too during the medical screenings. These kids were suffering from scabies. Scabies is a contagious skin disease marked by itching and rashes, caused by itch mite. If Chandehswor would recover, Upendra would have it and the cycle was continuous. The repetitive nature of the cycle made us look into the causes of the disease and we found out that their toilet routine was probably the most unhygienic aspect of their lives which was also the source of the disease. The other families in the slums have a make shift toilet which is quite bad but then it is better than having none at all. We cannot help these kids in that aspect but we have talked to them about the importance of hygiene and the instances of recurrence of disease have gone down relatively. Upendra, to his credit also has the gambling streak. The 24 hour informal channel of information is probably the most effective mechanisms we have established at Koseli so far. Since we talk a lot about NOT gambling at school, the children are beginning to understand that MAY BE its not a good thing and they should come and report if they spot their friends engaged in the game. 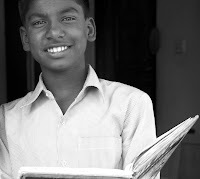 Soon through our network, we heard that Upendra had missed school to stay back and gamble. And since he didn’t have any money to gamble he became the dealer and actually ended up with some money in his kitty at the end of the day. I wondered if I should have been happy or sad at the news. This was the BIG NEWS of the day. So, when he came to the school the following day, all the other kids waited for him to get a big scolding. I was obviously very angry but in the last few months I have also realized that these kids don’t deserve to be scolded under any circumstances. I just talked to him at length. Sometimes, I wonder if they even understand a word of what I am saying as they look at me blankly with a smile leaking from the side of their lips all the time. Nevertheless, Upendra promised that he wouldn’t gamble again. I guess he also knew if gambled again then the information would reach school at the speed of light. The parents of these boys are very poor and live in the village. They have left them in the city to fend for themselves. Once or twice in a year the father takes them to the village. Recently they went to the village for a festival and turned up only three weeks later. When we talked to them, they told us they had a very good time in the village playing on the muddy village roads and fishing in the pond. Obviously, they did not attend any school during that period. While they love Koseli, they didn’t miss it during their stay in the village. They loved their carefree lives. I wish they had just stayed back in the village and attended school there. The story would have ended, but then as expected one fine day their father dumped them back in Kathmandu and the little kids are once again lost in the lanes of the slums and struggling for survival. “Upendra will be twice the age of normal Grade one child when he reaches there next year, provided he continues to come to school regularly this year”.